A collection of crime stories with diverse settings by award-winning Soho Press authors range from the noir to the humorous to provide fans with a shudder or a chuckle. In the noir category Helene Tursten’s “An Elderly Lady Seeks Peace at Christmastime” is a first class story of the danger of disturbing an old lady who just might be a psychopath. Maud has her own way of finding peace on earth, or at least her part of the earth. Two other stories that present a dark story set in the holiday season are James R. Benn’s “Red Christmas,” set in a North Korean POW camp in 1952; and Martin Limon’s “PX Christmas” set in South Korea in the 1970s. Neither story will elicit a chuckle. It is Christmas Eve and the POWs are singing hymns, and in one hut the prisoners are roasting a rat. Near starvation is a given, and a barter system is basic economics. It is the barter of a cheap pocket knife that leads to a murder that passes for justice in POW Camp 11. “PX Christmas” pits George Sueno, agent of the United States Army Criminal Investigation Division in Seoul, South Korea, against Huk, a South Korean owner of gambling halls and brothels, and a thoroughly bad guy. Sueno and Riley arrest Sookie, Korean wife of GI Roland Garfield, inadvertently setting off a chain of events that ends in handcuffs, a chain, railroad tracks, and the train from Pusan. Not a traditional present to Sookie and her GI husband, but an effective one. In “The Usual Santas” by Mick Herron, there are supposed to be eight Santas at the Whiteoaks Mall, “. . . a contemporary cathedral, sacred to the pursit of retail opportunity.” However, when Whiteoaks closes on Christmas Eve, and the eight Santas gather for the buffet in the hospitality room, there are nine Santas. Among the locales that might be less familiar to fans than the streets of America or England or increasingly, Scandanavia, are Thailand, Cuba, India, and Northern Ireland. “There’s Only One Father Christmas, Right?” by Colin Cotterill features an armed robbery by Father Christmas riding a motorcycle. However, which Father Christmas? Roger swears the police have arrested the wrong Santa. Meanwhile, the thief plans to give the money to the Thai boy that he has sponsored. “Only one act in a lifetime of dishonesty that I can say was completely unselfish.” In a sort of “Gift of the Magi” twist, what goes around comes around for the thief. In Timothy Hallinan’s “Chalee’s Nativity,” a Thai street girl named Chalee learns the true meaning of Christmas is seeing beyond what is there. In “The Cuban Marquise’s Jewelry” a Cuban refugee returns to Cuba and hires Padrino, former policeman now a private investigator and Santeria priest, to help her retrieve the jewels she left behind when she fled Cuba. Or so she says. On the other hand, “Queen of the Hill” by Stuart Neville is a graphic portrait of a psychopathic woman. Anne Mahon is queen of all kinds of nasty deeds in Belfast, and this Christmas will be no different. A different kind of female sleuth in “A Mother’s Curse” by Mette Ivie Harrison in which she introduces a mystery set against a Mormon background. One of the most likeable characters is Sheriff Morris Drew in “Blue Memories Start Calling.” An aging man who had been sheriff of the small town of Granite City for decades, Drew feels too old to be searching for who killed the Klein family. The only action remaining to the sheriff is to decide how to answer when the Klein relatives ask if their loved ones had suffered. But it’s Christmas, and the season calls for charity. Sherlock Holmes’s Irene Adler appears in “Cabaret Aux Assassin,” while Niccolo Machiavelli must choose between two leaders in “The Prince (of Peace).” If he fails to choose correctly, he will be dead. 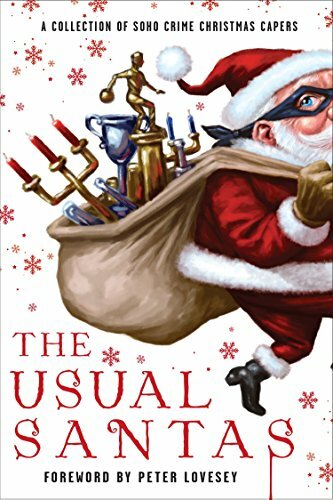 Another fictional character, Miss Jane Austin, finds a mystery to solve while visiting Bath at Christmas. “Jane and the Midnight Clear” is another puzzle mystery that remains one of Agatha Christie’s use of red herrings. As in any anthology, some of the stories are better written than others, but all will provide entertainment for the Christmas season.